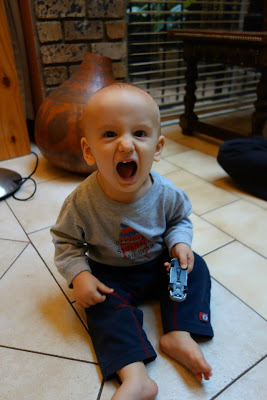 Mama Mzungu: Waiting for Words: When will Emmet start communicating and stop screaming? Waiting for Words: When will Emmet start communicating and stop screaming? “Ee jish?” Emmet asks me earnestly as he holds up the ball for my inspection. “Yes, I do see this Emmet” I reply. He also says “ma” with the "m" drawn out into a kind of whine, but, before you get too excited, we think means “more” since it's most often associated with his begging wanting something. He can imitate me when I ask - really implore - him to say “mama” but it unfailingly comes out “da da” syllables he spits out loudly and with a misplaced look of accomplishment. But that’s pretty much the extent of his vocabulary. He points and whines, and for special emphasis when mom is failing to understand that “I want the goddamn milk woman!” he screams. So, there’s communication happening. But no real words. Who needs language when this kind of behavior eventually gets you what you want? Still, I pretend he can talk, and he responds in kind. He thinks he can talk and streams of complete jibberish spill out of his mouth as if another language. It’s not a totally unfun charade, but underneath all this I wonder if I should be worried. His brother at 18 months had dozens of words. A quick look at the go-to parenting neuroses stoking/calming Website, BabyCenter.com, shows dozens of parents of under 1-year-olds sick with worry that their baby hasn’t said a word. At Emmet's one year check-up the doc, going through her routine list of questions, said, barely looking up from the list, “And he’s saying mama and baba and the like, right?” shaking her head 'yes' so convincingly that I just went along and agreed, since I figured it was right around the corner. I used to tell other similarly worried moms about my brilliant uncle who couldn’t speak until he was three. When he finally spoke the words spilled out in complete sentences, fully formed thoughts. Before this, his parents worried he might be intellectually impaired, and the central irony is that instead he grew to be an academic giant, the dean of a major university and a leading game theorist. This narrative is meant as a comfort, a lesson to parents to relax and know that each kid develops on their own timeline and that you can’t predict intelligence by it. But I have no expertise to back it up. Emmet is hearing two languages – English and Kiswahili – so that could be the root of his slight delay. And maybe “advice-giving Kim” is right: kids progress at their own rate. In my heart of hearts I know that Emmet is bright and communicative and that his language “explosion” is right around the corner. So, maybe I’m just getting impatient waiting for it. It does sound endearing. And I love the story of your uncle. Maybe it just runs in the family. My eldest took his sweet time and now has a larger vocabulary than any of his playmates, and my youngest is 19 months and much the same as your Emmet. I'm not worried, and you shouldn't be either. second kids learn to talk later than first kids (so all the day care teachers, who are around toddlers all the time, tell me). And kids in day care (around other kids approximately their own age who are also learning to talk) learn to talk earlier than kids who aren't. There is something about hearing other kids talk to them and try to communicate with them that makes toddlers really want to do it to. Do Caleb and Emmet communicate w/ each other (vs. thru you)? That's so interesting! Though I wonder why if daycare kids learn quicker that doesn't apply to younger sibs who are also surrounded by youngins speaking. So, Caleb definitely engages with Emmet, but it's often to tell him "no" or to repeat what I said to him. But it's starting. Still, I'm very reassured that you've heard second kids talk later!! Was that true for your kids? I think the reason daycare kids talk before 'sibling' kids is that when you are a younger kid, the older sibling speaks for you. "Younger sister wants milk" "Little brother needs a cookie". In daycare, the kids see the ones talking get what they want "I want milk" - but no one is advocating for them. Yes! It definitely does help. I think with the second born thing I keep hearing and the bilingual delay maybe Emmet is right on track!! And funny how each kid can be so different. Keeps us on our toes, I guess. Thanks for the reassurance! I've also heard the second-child theory. When I was panicking over Vicky not talking much by age 1 (supposedly, my friends' babies were all speaking fluent English by then-- heh), our daycare caregiver told me Vicky used receptive language all day long and they all had a blast asking her to fetch specific things. Apparently, *this* is the better marker of a delay-- if you ask Emmett for a ball or a cup or to point to Mama, what does he do? Love you all! It's a good point. Emmet does understand a lot, and in two languages. Rukia is constantly telling me that he will do simple things when she asks him to do them in swahili. And I feel like he really knows what he wants to say and even tries, but it all comes out "dada" or "wada" or "wadawada." I'm going to stop worrying for the time being. : ) Love back at you! My daughter, who did everything else a little early, didn't talk until she was two. There were a few sing-songy mamamama's and an occasional uh-oh, but that was it. I took her to the Dr. for her 2 year checkup and asked about having her hearing checked and was told to give her a few more months before we did. Two days after her birthday she walked into the kitchen and said, "Mom, what are we having for dinner?". She's 19 now, and still loves that story. She turned out to be the kind of person who likes to be really certain about something before she tries it. Why are book clubs so often all women?